Use GNMIDI 3 Professional synchronization editor to copy and paste the whole lyrics into the lyrics dialog. Even if you do not afford time for synchronizing lyrics they are embedded into the MIDI (META lyric) or MP3 file (id3 USLT). GNMIDI 3 player displays unsynchronized lyrics and scrolls automatically assuming according to song time. 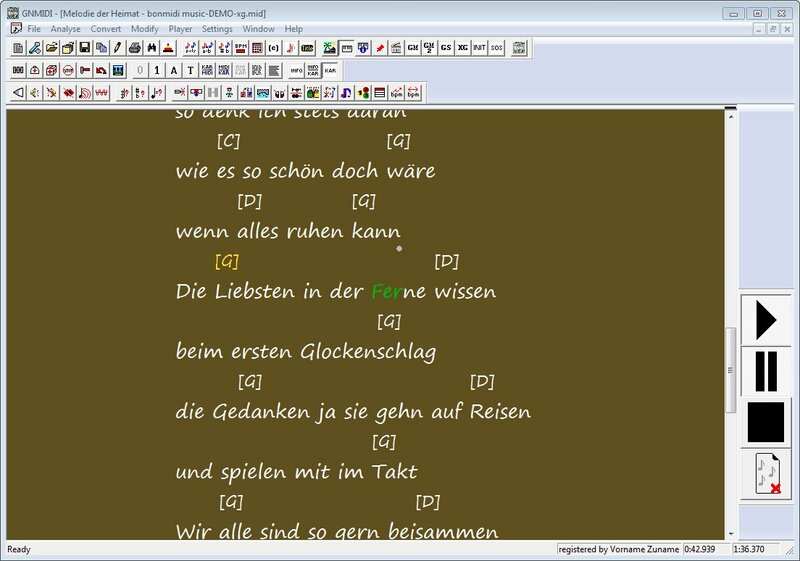 Even chord lines can be inserted above the lyric lines and are displayed by GNMIDI 3 Professional above the lyric words. Use GNMIDI 3 Professional synchronization editor to copy and paste the whole lyrics into the lyrics dialog. Then use the synchronization dialog to synchronize each line with a mouse click or key F5 during live playing. Complex line parts can be synchronized again if first try was not exact enough. Synchronizing a song line by line with GNMIDI 3 can be done within 5 minutes. Synchronized MP3 lyrics are embedded as Lyrics format or optionally id3 SYLT format. The unsynchronized mp3 lyrics are added too for players that only can display unsynchronized lyrics. Use GNMIDI 3 Professional karaoke editor to copy and paste the whole lyrics into the lyrics dialog. Then use the karaoke dialog to split words into syllables and move each to the melody note. The editor allows to play the current visible part that you can better identify the melody part. Synchronizing a MIDI song by syllables with GNMIDI 3 approximately takes 45 minutes. The synchronized syllables are embedded into the MIDI file as standard MIDI lyrics (META lyrics) and can be converted to other popular lyric formats (e.g. KAR, PSR, sysex). GNMIDI internal MIDI player displays the lyrics with a karaoke ball and optional chords above lyrics.